If every letter has a special meaning for a feature in a product, and a product portfolio offers a mix and match of those features, then eventually a combination of letters will end up with a secondary meaning. 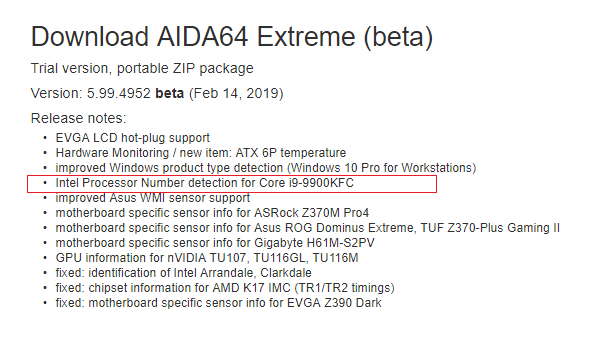 Today we’re seeing the beginning of the Kentucky Fried version of Intel: in the latest changelog to AIDA64, a well-known utility for system identification and testing, the company behind the software has added in the hooks and details for the Core i9-9900KFC. This CPU is as-yet unannounced by Intel. Software houses like the one behind AIDA, as well as OEMs, have to design software (and hardware) in advance of future products, and so they need to know the specifications and details in advance as well. It just so happens that sometimes those parts get listed in updates and changelogs, which is the case here. No other details other than the name are given, although we can infer a few things. Intel’s K processor line means that the processor will be overclockable, and the i9-9900 means that it will be using the fastest speeds of the generation. F processors are new to Intel’s lineup, and mean that the processor doesn’t have integrated graphics, and users will need a discrete graphics card to use the chip. But if the naming holds true here, then Intel might be set to offer eDRAM on its high-end eight core processors. Given that we saw benchmark performance increases only on a couple of benchmarks, it will be interesting to hear what Intel has to say about the added benefits are here. Having a non-integrated graphics part with extra hardware to improve graphics performance is like a double edged sword, except with no swords and two hilts. But at least it is deep fried and from Kentucky, right? 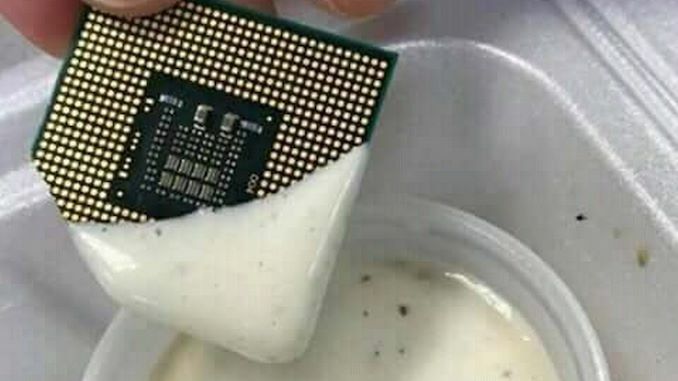 This chip needs some dip. We've reached out to the people behind AIDA, and Intel, for extra clarity on this processor. I think it's gonna be without IHS, just for Overclockers.